I finished my basket! It’s a day later than I had hoped, but today is when I had the chunk of free time and the sunny patio to work on. At any rate, it’s done. I’m 75% happy with it. All I can see are the little details that I wish I’d done better, but even when it wasn’t completely finished it still held fruit so I think I’m calling it a success. – It is probably impossible to make a perfect basket the first time. – Some crafts are so new to me that I don’t even know what success or failure looks like, or even what questions to ask. – I’m realizing that the premise of this blog may be a little silly. There is no way to get any kind of proficiency at a technique by only devoting one week to it. Then I remember that without this blog I wouldn’t have tried and I feel better. – Procrastination is still an issue. Next week it’s back to the couch with some small handwork in the hopes that I can get done on time. See you there! By the way, my crochet scarf was featured on the blog One Pretty Thing this morning. Welcome new visitors! I’m going to spend some time making past projects more easily findable. I haven’t had a chance to finish my basket yet. I hope to get some time this afternoon. Check back tomorrow for the completed basket (I hope). If you just can’t wait, look at some of the awesome completed projects in the Basket group on Flickr. They’re very inspiring! I signed up for this particular basket making class not because I was especially enamored with the hen basket, but because it happened to fall on a day and time that I was free. In fact, I didn’t even look up anything about hen baskets before I went. I figured that we would make a basic basket and I’d be on my way. Well, it turns out that the hen basket is a ribbed basket, and that these are kind of tricky. I dove right in. The first thing we did was join the three rings (above) with zip ties in the configuration they would be in the final basket. We then inserted a small coat hanger to prop the outer circles at a fixed distance and secured it with clamps. Then it was time to weave. Here you can see part of the handle and the first ribs. The ribs add to the structure of the basket and are continually added as you go along. As the basket takes shape the ribs are adjusted up or down to provide the final shape of the basket. In this photo you can see my basket in progress with a few more ribs. You have to weave both sides similarly to have a symmetrical basket. It also helps hold the ribs in. Notice the pink coat hanger still doing its job. Fun fact about hen baskets: before the bottom is shaped they tend to roll off the table when left unattended. My basket after almost 5 hours of work next to the example basket brought in by the instructor. It is at this point that you start to fill in the bottom of the basket and work up to meet the sides. It was also that this point that I noticed my basket was seriously lopsided. The instructor promised me that I just need to wrangle it into place, and I look forward to doing that when I finish weaving. I didn’t get too much further than the photo above when I left the class. I’ll finish it at home later this week. Many thanks to the instructor and other students for a fun first basketweaving class! I’ve lived in Raleigh for 12 years, but it wasn’t until a couple of weeks ago that I learned about the Leisure Ledger. I had a vague notion of City arts centers around town, and that they probably offered classes, but I had no idea of the wide variety of activities available to me. I certainly would have taken advantage of them before now! So don’t be like me, look at the Leisure Ledger every quarter and discover the fun things that there are to do in this town. If you live somewhere else and haven’t found a similar publication I encourage you to do so! Having found and signed up for the basketweaving class (which is offered every month with a different style of basket each time) all I had to do was show up. I’ll share my class experience with you tomorrow! This week I’m going to try my hand at basketweaving. I remember learning to make a basket with my mom when I was a little girl in 4H, but I haven’t done it since. Also, it turns out I’m unaware of a lot of the more intricate basket styles. Can I do it? Will it turn out all lopsided? 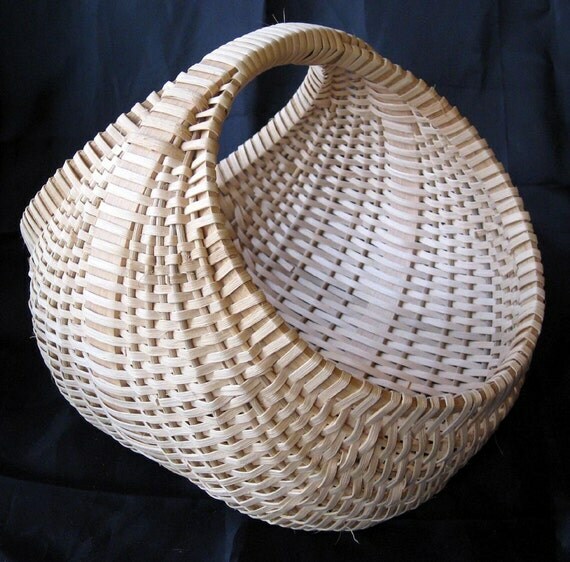 Join me as I make a hen basket like the kind shown above. You are currently browsing the archives for the Basketweaving category.